Home Recipes Dinner Pan-Seared Honey Mustard Salmon. A Protein Packed Meal! I love salmon! It’s filled with omega-3’s and is packed with protein! This pan seared salmon is great because it helps mask that overly fishy taste that some salmon has. This pan seared salmon was made for those busy weeknights! After letting this marinate (even that part is options) you can throw this right onto the pan, cook for 6 minutes, and you’re done! Pan searing each side of the salmon for three minutes on high gives it a nice color, a crispy texture, and cooks it in no time! I love salmon but of I’m being honest, sometimes it tastes overly fishy for me! It might be the type of salmon or wild vs. farmed. Whatever the case, sometimes my salmon is not super appetizing. I’m glad honey mustard dressings go with everything because this salmon came out wonderfully! I even have a version of this marinade for my chicken salad. If you love salmon, you’ll have to give this pan seared salmon a try. Not sure what kind of salmon to buy? Check out this guide on buying the best salmon that’s good for you and good for the environment. Looking for a Great Side to go with This Dish? This pan seared salmon is the perfect weeknight meal! 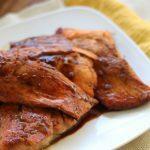 Marinated in honey mustard and soy sauce, this will become your new weeknight staple! Dry off the salmon with a paper towel. Season with salt and pepper. In a medium bowl, whisk together the mustard, aminos, and honey. Normally I don't add salt, but you can if you would like. I also make sure to season the sauce with pepper. Add the salmon to the bowl so marinate. I like to let them soak up the marinade for at least 15 minutes but you can skip this step. In a nonstick or cast iron pan, add the olive oil over medium-high heat. Add the salmon and increase the heat to high. Cook on one side for 3 minutes and then immediately flip it over and cook the other side for 3 minutes. Remember the salmon will continue to cook with the residual heat of the pan once you take it out so if it looks a bit underdone, don't worry! Let it read for a couple minutes and then serve. Serve and enjoy! I like to eat this with veggies on the side. Next articleBoost Your Immune System with this Hearty Mushroom Soup!